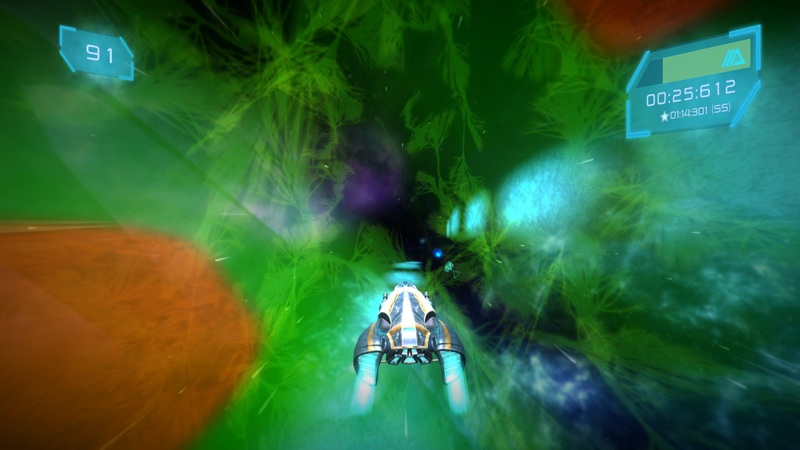 Astral Traveler is a single player arcade racer from Dragon Slumber and Brainoid Games. Well there’s really no story at all here, since it’s a purely arcade-focused game. The game is simple enough; race to end of the track, dodging whatever obstacles come along. Your vehicle has an energy meter that constantly runs out. In order to fill it back up, you need to shoot blue orbs scattered about the levels. Alternatively, if you’re feeling confident, you can “phase” through the orbs for a burst of speed. There are enemies that can give you trouble as well. This all sounds actually really great in theory. In execution though, it doesn’t always nail it. 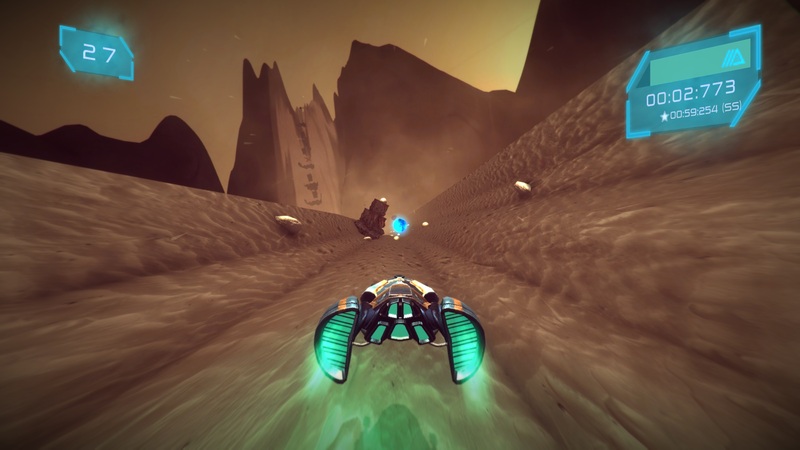 With a game centered around going fast, you want to be able to clearly see obstacles coming your way. Visual design in games like this is key, and it’s this area where I had issues. In some stages, obstacles could blend in with the track, making it very hard to actually see what’s coming. The track itself generally consists of only a couple textures, which made perceiving how close I was to obstacles somewhat difficult. Astral Traveler can get very, very fast. Sometimes even too fast. 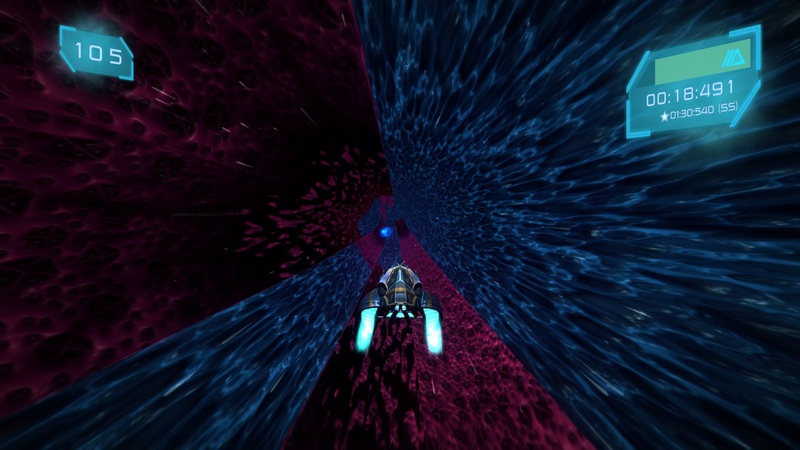 Your first run through each level, you’re not gonna want to hold down the accelerator much. At maximum speed, obstacles come up way too fast to dodge on reaction. This sounds like the game rewards players that memorized the level. This is true, but combine this with the aforementioned issue of poor visual design, and it can seem unfair when you’re going through levels the first time. If there is any saving grace, it’s that the controls are surprisingly smooth. There are enemies in the game, which can fire lasers to give you a hard time. It can be very hard to dodge their attacks though. They’re not very well telegraphed. The best thing to do is dispatch them as soon as possible. Unfortunately, the hit detection of these guys doesn’t seem great. Sometimes they’d be gone before they got a chance to attack. Other times it seemed like I’d be firing away at them, and they didn’t particularly care. Overall though, I can’t really say this adds much of anything to the gameplay. It’s just another thing you have to worry about, and I don’t think much would be lost if it wasn’t in there to begin with. 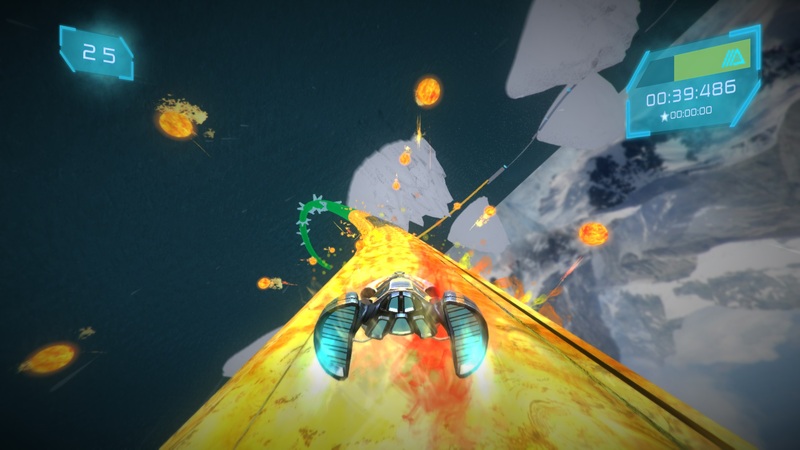 Platforming in a racing game might sound odd, but this game doesn’t do a terrible job of it. Where a track ends is pretty well sign-posted, so there is plenty of opportunity to prepare for the jump. This doesn’t feel as tacked on as the shooting does. However, when looking at all the parts of this game, they just don’t mesh very well. In segments where you have to do more than one of these at a time, it doesn’t feel very good. Trying to platform while also avoiding enemies and obstacles can be pretty trying. Probably my least favorite parts of certain levels were flying segments. I’m not sure what the issue was exactly, but I had a real problem with depth perception here and determining where I was actually allowed to fly. The controls here are also extremely sensitive and slippery. These segments often call for precise movements, and doing so is difficult. Another annoying thing is that if you run into an obstacle, the camera shakes. Not just a little bit, but so much that it’s seriously disorienting. If you hit one thing, it’s pretty likely you’re going to hit something else, simply because you’re still going as fast as you were before, only the camera is freaking out. On certain levels, this could very easily lead to you falling off the track. Make one mistake and more are sure to pile up. There are six distinct zones, and the only real difference between them is their aesthetics. The first area had a forest theme. Another had a desert theme. Mechanically, it comes down to the same thing: dodge some obstacles in your way, shoot down enemies, and do some platforming. I can’t say there’s a whole lot of mechanic depth to this game. It just becomes memorizing each track and doing it over and over until you get that perfect run. The parts of each level all feel disparate and don’t really come together to form a cohesive experience. Astral Traveler’s music didn’t take long for it to become grating. It’s just loud and annoying electronic music that was so distracting, I played the game entirely muted. Visually, the game isn’t exactly a looker. As I mentioned before, tracks only use a few textures, and the textures themselves don’t look particularly great. Racing games tend to have strong visuals, and this game really drops the ball in this regard. My biggest peeve for the game though is how the system requirements don’t seem to be very accurate. Going off of them, you’d think any low-end computer could play this no problem, but that wasn’t the case. I tested this on a very low-end laptop and while some levels ran acceptably well, others had framerates in the single digits, even on the lowest settings. There is a good idea for a game here, but it just has way too many issues. The levels themselves weren’t very interesting, and stuff like enemies shooting at you and the flying segments feel poorly implemented. Even though this game is relatively cheap, only $5, I don’t think I can recommend it.